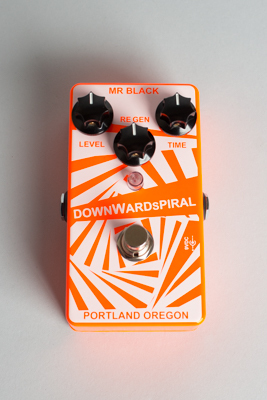 Mr. Black Downward Spiral Model Delay Effect (2017), made in Portland, Oregon, Bright Orange finish. Overall length is 4 7/16 in. (11.3 cm. ), 2 3/4 in. (7 cm.) width, and 1 7/8 in. (4.8 cm.) high. New Condition.